With the requirement of many customers, we designed and manufactured the GMP35/30 model, which is a piston mortar pump with single cylinder and acting. It is used for transmitting cement mortar or plaster. When it’s equipped with spraying gun and relative accessories, it also could be used for spraying. 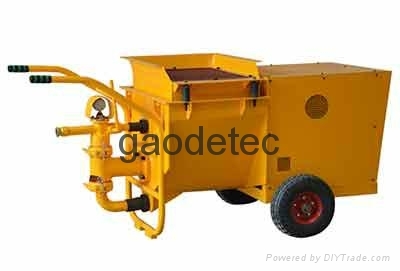 This cement mortar spraying machine is widely used on interior walls, tunnel excavation and maintenance, mine engineering, constructing dams, bridges and foundation treatment projects etc. If you want more information, please feel free to contact us at info@gaodetec.com.